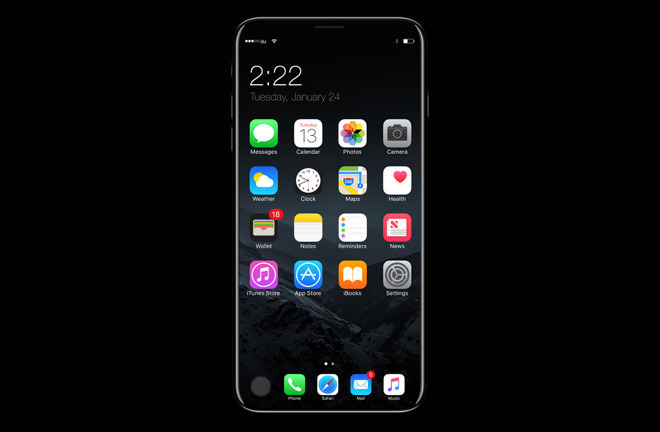 After a supply chain visit, Bank of America Merrill Lynch is the latest firm to predict a launch up to a month later than usual for the as-yet unannounced "iPhone 8" and an accompanying drop in sales through the end of the calendar year —but still a blockbuster 2018 ahead for Apple. Wamsi Mohan and Stefano Pascale of Bank of America penned the report to investors, which was supplied to CNBC. The pair of analysts cite issues with the fingerprint and 3D sensors for a device that will "ship 3-4 weeks delayed" as compared to the regular timing for a fall iPhone refresh. As a result of the lack of availability, the analysts cut expectations for the quarter ending in September by 11 million, and the holiday quarter by 6 million. However, the analysts don't believe that the sales are lost —the March quarter shipment estimates have been raised by 10 million, with 243 million shipments still expected in fiscal year 2018. Apple's record fiscal year 2015 saw 231 million sales, with Wall Street consensus before this report is factored in at 244 million. It is not clear if the report from Bank of America is a truly independent report, or a reiteration of other reports citing delays in the product. AppleInsider reached out to Bank of America for the full report to glean more insight on how the conclusions were reached, but access was denied.